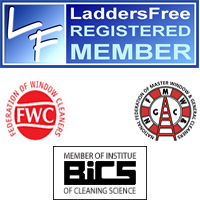 Why use Water-fed pole cleaning methodsThis method is by far the safest and most effective method of cleaning windows developed and is recognised by operators and clients alike, as the future industry standard. We have been using this system for 5 years, and continue to invest in the latest developments in this field, ensuring that our clients are given the best possible service. We can access windows up to 65 feet safely, working from the ground. When we arrive on site we carry a supply of 100% pure water, sufficient to provide 6 hours continuous working for 2 operators. We are also equipped to top up our supplies on site, should the job require it. This method Fully complies with all health & safety regulations. We are delighted to announce that we have been awarded CHAPS certification is an accreditation scheme that assesses the health & safety competency of contractors and service providers. Clients have a legal obligation to ensure that external contractors and service providers working on their premises operate in a safe way. The Indoor Clean Pole is an innovative product. 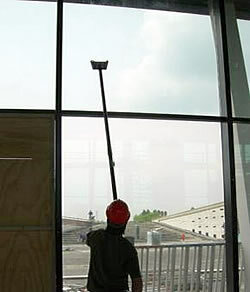 The system offers a practical solution for the cleaning of all kinds of glass walls and other smooth surfaces inside buildings, which are difficult to reach i.e. stairwells. With the Indoor Clean Pole your will be able to clean these difficult to reach windows without contravening the Occupational Health and Safety Act. The Indoor Clean Pole uses a spraying system containing purified water. This purified water is free of all minerals and impurities Together with a special micro fibre pad, this results in a clean and smear free finish. In addition, window frames, sills and carpets will no longer have dirty splash marks, thanks to the this new application technique. All this makes the Indoor Clean Pole an environmentally friendly and ergonomically sound window-cleaning system! 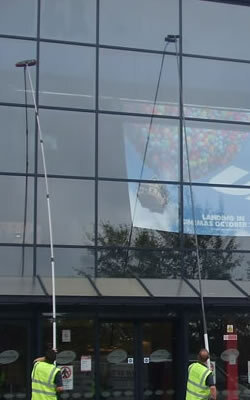 Contact us today for commercial window cleaning in east London.